JAM Stage – Wide Open Bluegrass! Junior Appalachian Musicians, Inc. (JAM), a nonprofit organization based in Independence, VA, will be showcasing more than fifty bluegrass and old time youth musicians at the upcoming International Bluegrass Music Association’s Wide Open Bluegrass festival in Raleigh, North Carolina. JAM is celebrating its fifth year coordinating programming for the free street fest, which drew more than 200,000 people last year. Wide Open Bluegrass will be held Friday and Saturday, September 28-29, 2018 in downtown Raleigh. Fifteen different acts will fill the JAM Stage located on Martin Street, beginning at noon on Friday and 11 a.m. on Saturday. The live music will run all day on the hour until 8 p.m.
As the parent organization for more than forty after school Junior Appalachian Musicians programs in the four-state region of North Carolina, South Carolina, Tennessee and Virginia, one of JAM’s benefits to its affiliate programs is to provide major performance opportunities to young musicians who are currently enrolled or got started in a JAM program. The organization’s director, Brett Morris Martin, testifies that JAM is a brilliant way to provide kids with education about their unique cultural music and dance that they may not otherwise have access to. The program also creates a strong foundation for a lifelong love of music and the arts, as well as lasting connections to their home communities. “Many students and families in more rural areas also appreciate the performance and travel opportunities that come with JAM,” said Martin. The JAM Stage at Wide Open Bluegrass will be highlighting current students from the programs located throughout the JAM region. The lineup of JAM student pickers includes Blackberry JAM (Caldwell County, NC), Sweet Potato Pie Kids (Pickens, SC), Henderson JAM Kids (Smyth County, VA), Ashe JAM Band (Ashe Co, NC), Junior Appalachian Musicians Band (students from Alleghany and Ashe, NC, as well as Galax and Floyd, VA), Possum on a Whale (Haywood County, NC), Karlie Keepfer & Smokey Holler (Alleghany County, NC), and Jonah Graves (Cherokee County, NC). 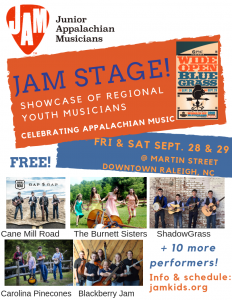 Some of the top youth bands in bluegrass and Appalachian music with experience in the program will also be featured on the JAM Stage, such as Cane Mill Road, ShadowGrass, the The Burnett Sisters, the Carolina Pinecones, Ella & Mary, Eliza Meyer, and One Fret Over. A special performance by Carl Johnson, a renowned African-American bluegrass banjo player and singer, joined by a few JAM Allstars, is also included in the lineup. The full schedule is available online at wideopenbluegrass.com. This project is made possible through the JAM Board of Directors, the North Carolina Arts Council, and many private donors.